Partnered with Sturgis Davis in Providence in the firm of Davis & Babbitt c. 1824-1828 then Davis, Babbitt & Co. 1828-1830. Tucson and Scottsdale, AZ c.
Successor to Bailey & Co. George W. Banks and Samuel Biddle joined forces with Joseph T. Bailey II in 1878 and formed Bailey, Banks & Biddle. 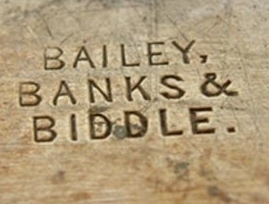 The name was changed to Bailey, Banks & Biddle Co. when the company incorporated in 1894. Makers and retailers of quality sterling flatware, holloware, jewelry and novelty items. Hugh Bailey, James Bailey, Thomas Bailey, William Bailey, John J. Brown, and Thomas C. Stephens. Primarily retailers. Successor to Bailey & Kitchen. When Eli Westcot Bailey, the brother of Bailey & Kitchen founder Joseph T. Bailey, along with James Gallagher and Jeremiah Robbins joined Bailey & Kitchen, they formed a new partnership and named it Bailey & Co. Joseph T. Bailey II was added as a partner in 1856. Founder Joseph T. Bailey died in 1854. Forerunner to Bailey, Banks and Biddle. Simon W. Bailey, Joshua V. Kettell, and John N. Chapman. Succeeded by Bailey, Chapman & Co. The origin is in the partnership formed in 1832 by Joseph T. Bailey and Andrew B. Kitchen. Partners Joseph Trowbridge Bailey and Andrew B. Kitchen. Kitchen died in 1840 and the name remained the same until 1846. Forerunner to Bailey, Banks and Biddle. Jewelers and silversmiths. Bradbury Melon Bailey and Wilbur F. Parker. Was in the firms of E.E. & S.C. Bailey 1836-1862 and E.E. Bailey & Co. 1837-1839. 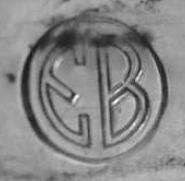 Was in partnership with Samuel C. Bailey, Charles Chase Bailey and Ebenezer Eaton Bailey in Claremont, NH as E.E. Bailey & Co. 1837-1839. Makers of sterling flatware, hollow-ware, and novelties, including many fancy and unusual flatware serving pieces. Flatware Patterns by Baker-Manchester Co. In partnership with Jabez Baldwin in the firm of Baldwin & Baker c. 1817-1819. Jabez Baldwin and John Belnap Jones. Makers of sterling flatware, holloware, jewelry and souvenir spoons. The B.M. Co. mark was used until 1915. No relation to Baldwin & Miller, Inc. Founded by Milton Baldwin and Fred W. Miller Sr. Makers of sterling and pewter holloware, trophies, and novelties. No relation to Baldwin, Miller Co., Inc.
Samuel Baldwin and Richard Smith. Jesse G. Baldwin and Seymour W. Baldwin. John Baldwin and Samuel E. Baldwin. In the firm of J. & S. Baldwin 1831-1833. Makers of sterling holloware and jewelry. 1874. Makers and retailers of quality sterling flatware and holloware. William Ball and and John S. Heald. Henry Ball, Erastus O. Tompkins and William Black. 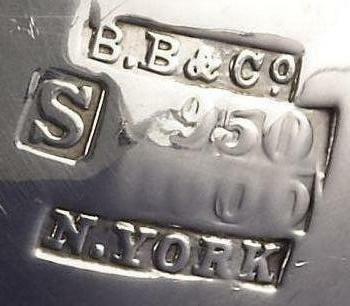 Successors to Marquand & Co. and succeeded by Ball, Black & Co.
Born in the year 1832. In the partnership of Stone & Ball with Seymour H. Stone 1853-1869. Silversmith and jeweler. A watchmaking and jewelry house; made an assortment of souvenir spoons in the early 1900s. William Ball was born 1763 and pass away 1815. In the partnership of Johnson & Ball with Israel Johnson 1785-1790 and later the partnership of Ball & Heald with John S. Heald 1811-1812.